Show us your Stash…. Rachel! One more brave blogger has held up her hand and admitted stashing. Rachel from House of Pinheiro has graciously answered Kat & my questions about her stashing habits, and sent us some lovely photos as evidence. The longer we do this, the more I am ashamed about my organisation – or lack thereof! I first threaded a machine in Sept 2009, completing my 1st ever project (a denim skirt) early December. By then, I was hooked by the sewing bug and my fellow had no choice but to get me a machine for Christmas. For the 1st year, I only bought what I needed for each project. That meant fabric, threads, zippers… nothing extra, very controlled. 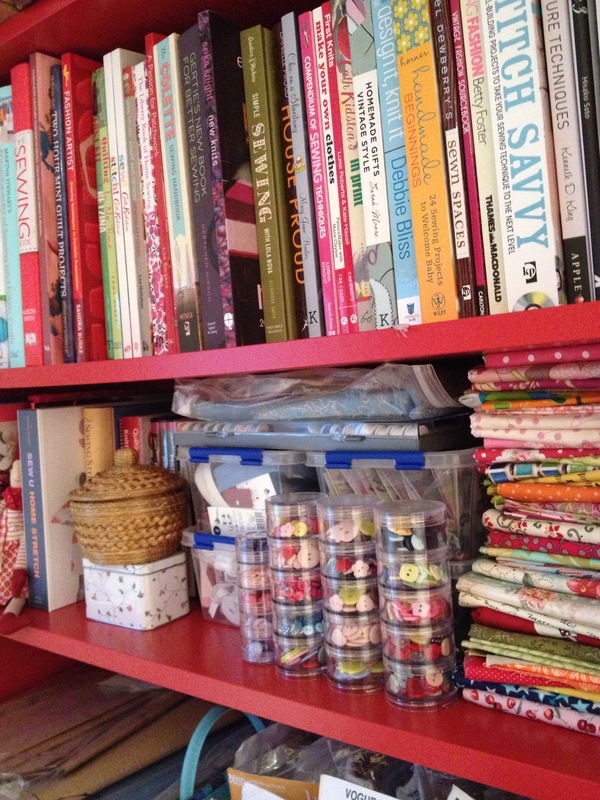 My stash actually started building when my sewing books started to take space out from my baking bookshelf. As I enjoy quilting too, those little fat quarters sure know how to multiply…. By mid 2011, when I started to engage with other sewists and the blogsphere, my fabric shopping attitude changed and I started to buy a lot more fabric, specially during meet ups. Blogging is the biggest stash enabler. That’s why I loved your idea to community de-stashing. 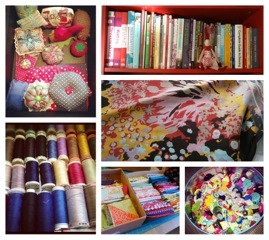 Last year my stash has grown from 10 pieces of fabrics to 40. That’s not considering my quilting fabrics. I’m trying to avoid shopping online and only buy maximum of 3 pieces during meet ups shopping trips and that seems to do the trick and stabilise my fabric stash growth. I don’t know how many sewing magazines or haberdashery I own. I like to keep it all tidy into boxes and dive in when I need something. I only recently stated cataloguing my stash using APP Evernote. It’s fantastic. I used it often at work. I use it for adding blog post ideas, general notes and visual photo and info of my stash. I’m hoping to catalogue everything I own by the end of the year. I have been meaning to blog my progress as a means of getting me doing it. My last pattern count was a bit over 130… Scarily growing. My sewing addiction is actually stashing a bit of everything. I hate when I am in the middle of a project or at the start of an idea and I got to go out to buy something. My buying reflects that… I have at least something of everything I would need – like running a small shop! Now that I tidied all my equipment in one place I found I had a bit more than one, lol. My current pincushion collection count is 10. Where do you keep your stash? How do you store it, etc? I keep my dressmaking fabrics divided into sections inside the bottom of a wardrobe. It’s sectioned by left side being summer and right side being winter. Every few months I pull the fabrics out and check what I want to sew with. Then I arrange the ones I want to use first at the top of the pile for easy access. I would love to have separate drawers so I could also separate by season and content. 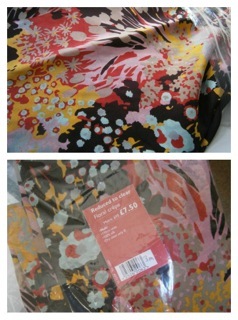 My more expensive fabrics are also in a transparent plastic bag. Some fabrics have note with description of size and content. That’s another problem I hope Evernote will fix. When you have a small stash, it’s so easy to control what you have but now, I feel if I don’t get organised immediately my stash will explode and I will really loose time digging in. 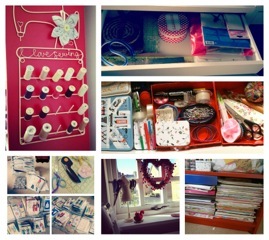 My daily sewing equipment is kept in 2 drawers on the sewing table. Everything else on my bookshelf, he bookshelf arrangement keeps changing as I buy more stuff and try to fit in. My patterns are kept in 2 big baskets, the light colour is the patterns already cut and the blue are the uncut patterns. All the cut patterns are stored in individual plastic folders. My oldest piece is this beautiful and flimsy Diane Von Furstenberg inspired silk. It was on sale, and I bought it by the end of 2009. I like to find special fabrics for special projects. At the time I didn’t have anything in mind for it or even now, I don’t… so it’s back to the stash. That fabric will have it’s time to shine sometime in the future. What’s you favourite piece in the stash? Where did you get it, what do you love about it and what do you think you might do with it? That all time favourite piece has been transformed into V8674, version C and recently I used the left over on Cynthia Rowley Tulip Skirt 2512. This beautiful Mohair wool from Macculloch & Wallis cost me £30 per metre. I had bought 3m of it and don’t regret at all. I love wearing it. It’s warm, soft, elegant and looks very expensive! The next one, it’s a lovely black and white houndstooth wool that I bought back in 2011 and It’s going to be Colette Anise. Very Chanel inspired. I love it for the same reason of the mohair wool above. I have Poly-phobia. I don’t like to buy polyester (knowingly) and rarely will buy man made fabrics unless blended on natural fabrics like cotton satin. I have a passion for wools and linen. No, everything is fair game. I will rarely buy fabric for a specific project. I will always try my stash first, so I am constant stash busting mode, but to help the cause I’m on a fabric shopping ban until my birthday. That’s 6 months away! 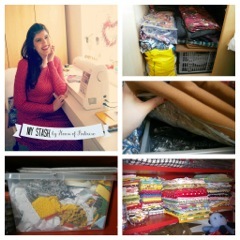 Thank you so much, Rachel, for letting us have a peek at your sewing room. I think it’s time I did some re-organising of my own! Don’t forget, if you’d like to take part in our stash swap, leave a comment below. Check out the guidelines etc on Kat’s blog. Great post! Nice to know that I’m not alone with my fabric-addiction! 🙂 Only my stash is nowhere near as well organized! 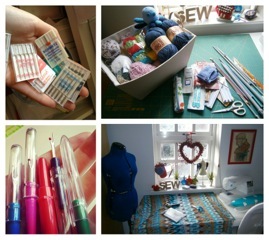 I admire how tidy your sewing area is. The button holder is superb!